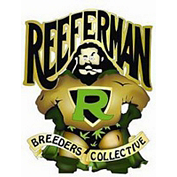 Reeferman is one of a number of Canadian seed producers that are now beginning to seriously compete with the Dutch cannabis establishment. In 2004, Reeferman won the Seed Company Sativa Cup for his Love Potion #1 strain. The drive behind Reeferman Seeds is a response to the fact that much of the cannabis gene pool is in decline, and that some clones being passed around Holland are 20+ years old. Charles Scott (Reeferman) argues that retaining diversity of genetics is the best way to ensure the existence of a healthy lifeline as cannabis progresses further into the 21st century. Reeferman has experimented with several popular strains from the 70s, including Panama Red and Santa Marta Gold. In 2004, Charles won his first cup, the #1 Seed Company Sativa Cup, and has received numerous awards since, including a win at the 2014 Bio Cannabis Cup in Spain. Buy Reeferman Seeds from Bonza today.